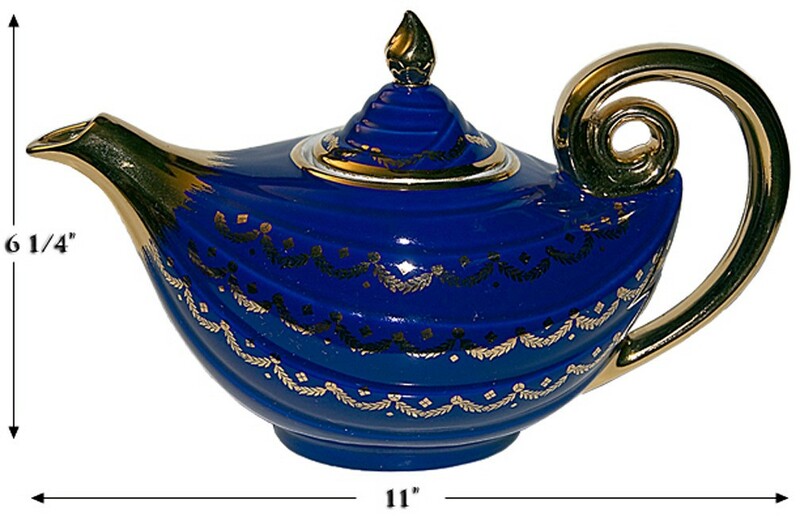 Condition: We are offering for sale a beautiful Hall China Marine Blue Gold Label Swag Aladdin Teapot. This teapot was part of a line called Gold Label (please read about this pattern line below). This striking hard to find teapot is in Undamaged Condition without chips, cracks, or mold damage. The glazing is wonderful. The spout has some very minimal gold wear at the very tip end. I would rate the gold at 98% on this teapot; just beautiful. Description / About: Marine Blue Gold Label Aladdin Teapot: 6 1/4" H. - 11" L.
Gold Label Line: Hall selected 12 shapes from the Gold Decorated line in the mid-1950s and added additional gold decoration to produce the Gold Label line. Gold designs included Squiggle, Swag, Reflection, Nova, Fleur-de-lis, Daisy, Grid, Star, Medallion, Flower, Basket and Dot. Teapots in the new line have an extensive gold decoration and may be identified through a gold code number on the bottom followed by the letters " GL". The handles spouts, and knobs of the lids to these teapots are covered with gold. In addition to the teapots, eight kitchenware shapes were also selected for the use in the Gold Label line. 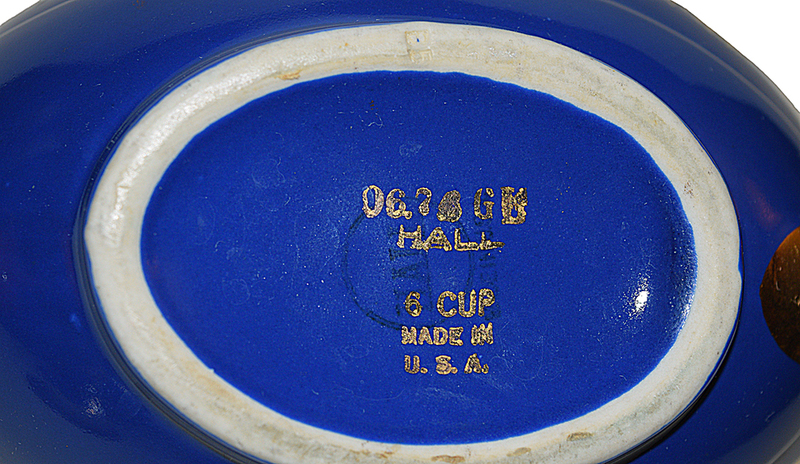 Included were the 9" salad bowl, "Terrace" coffee pot, Zeisel cookie jar, "Rayed" jug, the 376 round casserole, and the three-piece "Thick Rim" bowl set. There is also a French baker that exists in the Squiggle line.